Earlier this month, I wrote about Coca-Cola bringing out a new flavour over here to the UK. It's a peach version of its Coke Zero range. I mentioned that, as soon as I found a bottle, I would give it a go. I tried it the other day. I don't really know what to make of it. It's hard to describe, but with other Coke drinks with flavour (Vanilla, Cherry, Lime), you get the Coke taste along with the other flavour as an after-taste. 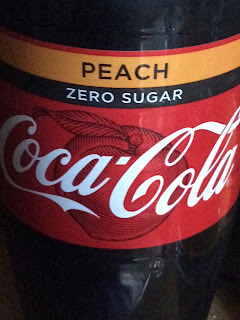 With this drink, the taste of peach is more prominent than that of the cola. If that makes sense. Not that it wasn't bad. It just didn't really taste of Coke!